The decision to split StarCraft II into three games caused quite a bit of an uproar when it was announced years ago. Fears of a less than full experience raged in the community. The decision to split StarCraft II into three games caused quite a bit of an uproar when it was announced years ago. Fears of a less than full experience raged in the community. When the first game, Wings Of Liberty, came out, fears were somewhat quelled. Wings of Liberty was a full fledged campaign and paid the deepest homages possible to the gameplay of its predecessor. Three years later the second game in the trilogy, Heart of the Swarm, is finally out and it brings new units to multiplayer, a 20+ mission campaign, and tweaks to the UI (most of which are patched into Wings of Liberty without need of Heart of the Swarm). It is actually kind of nice to get added content in the form of old school pc expansion packs rather than the piecemeal DLC this console’s generation has shoved down our throats. Most StarCraft fans will feel the same way since it was in 1998 when Blizzard released the original game and its expansion Brood Wars. It took twelve years before Blizzard delivered the Terran themed Wings of Liberty that followed Raynor on his quest of revenge that transitioned into a quest for Sarah Kerrigan’s salvation. It ended with Raynor using a Xel’Naga artifact to transform Kerrigan from the Queen of Blades back into a mostly human and carrying her off into the sunset. Heart of the Swarm picks up the story three weeks later with Prince Valerian experimenting on Kerrigan to test her abilities. This gives players a nice tutorial on Zerg base building built into the plot and prepares them for the differences from playing as Terran. The next mission Raynor and Kerrigan have to escape a Dominion attack and get separated just 2 missions into the game. 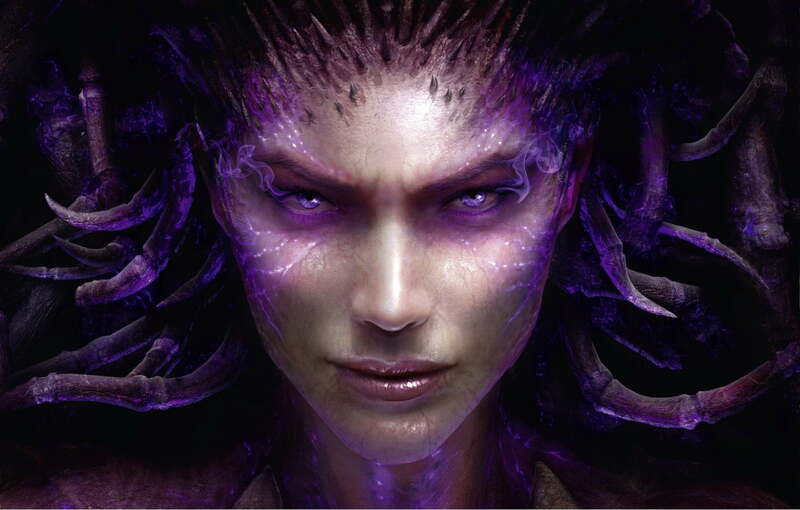 Kerrigan ends up returning to her Zerg lifestyle but with a soul and conscience that she must come to terms with her past selves as a human and Zerg and rectify them with what she needs to become to save the universe from the ominous threats in the future experienced by Zeratul and Raynor by proxy in Wings of Liberty. First on her plate though is getting back to that age old quest of revenge against the Dominion and Arcturus Mengsk. Unfortunately for Kerrigan, the artifact gave her back her conscience and it compounds with her love for Raynor and sacrifice he suffered bringing her back from the Zerg. She now sheepishly shows mercy throughout the game for the innocent. We still get to experience the ruthless Kerrigan as she wages war against those that stand in her way. Kerrigan travels around in huge living Zerg ships called Leviathans after the initial world is finished. Heart of the Swarm moves away slightly from the branching of missions and the pick and choose what to do next aspect of Wings of Liberty. While you still have a choice of picking which planet you wish to tackle first, you can’t go to the next until you finish the one you are currently on. The Zerg crew of her ship have a multitude of more personality than Raynor’s Raiders and every conversation was filled with catchy quotes. Heart of the Swarm has 20 full fledged missions and 7 evolution missions bringing the final total to 27 missions. There is only 1 non Zerg mission late in the game leaving Heart of the Swarm filled with Zerg goodness. Upgrades move away from the permanent choices found in Wings of Liberty. The 7 main units of the Zerg army have a choice of three switchable mutations that you can pick and choose between missions. Kerrigan herself can have seven mutations, each one a choice out of 3 per tier. The 7 evolution missions mentioned before gives players a permanent mutation choice for each of the Zerg critters and allow players to test out both mutations before having to choose via the mission. One of the biggest changes going from Wings of Liberty to Heart of the Swarm is that Kerrigan is on the battlefield for nearly every mission. She feels very much like the hero units found in another Blizzard title, Warcraft 3. Completing mission and bonus objectives allows Kerrigan to gain levels which in turn give her more health, damage, and armor. Kerrigan’s tier based upgrades are also based on her leveling up scheme. It usually does not spell the end of the mission if Kerrigan dies either as she will resurrect from the hive after a couple of minutes. Between the powers and living being not critical, Kerrigan ends up feeling a bit like easy mode in the early parts of the campaign. Her powers devastate enemy units and she is only truly tested by late game masses of enemies. Some of the great missions from StarCraft’s past include the ones without base building and have players controlling a small set of units. Heart of the Swarm appears to take this to heart, pun intended. Several missions have “boss fights” that pit Kerrigan against large enemies. They never really get beyond the whole attack until you need to dodge their attack strategy though. There is actually 1 mission that consists of only 3 mini boss fights and 1 big bad boss fight. It is easy to see where some fans can be turned off by this departure from the base building formula but these missions almost feel natural to the extent that Kerrigan is used throughout the game as a unit. Being an expansion, Heart of the Swarm shares the same graphics as Wings of Liberty and even 3 years later they still look great. Being a Blizzard product guarantees two things outside of incredible gameplay and balance, great cutscenes and great voice acting. Heart of the Swarm does not disappoint on either of those. The musical score of the game is easily movie quality and well worth getting the soundtrack for. The multiplayer remains largely untouched outside of a couple of unit stat tweaks and the addition of the seven units across the three races. While the new units may change up a couple of strategies, none of them appear to be balance breaking. That is not to say that the units aren’t useful. Terran Widow Mines bring a new level of harassment by burrowing and launching a rocket attack every half minute that has huge damage and a nice splash bonus. Zerg Viper’s fix a weakness against siege tank defense by using a skill that pulls enemy units to the Viper. The systems surrounding the multiplayer have seen some major changes that have filtered back to Wings of Liberty via patches so a lot of systems and tweaks are not exclusive to Heart of the Swarm. Blizzard has handled this aspect admirably by continuing to make Wings of Liberty a better game. The spread of skill levels has changed over the various tiers to keep weaker players from getting massacred by the pros. Clan and group support has finally been added officially and is something that needs to be in more games. Ranked matches now give experience and players have a level for each race. You unlock new portraits for each level giving players another goal in the multiplayer. There are other smaller tweaks that you may notice like in mission clocks and workers that automatically start collecting at the beginning of missions. StarCraft II: Heart of the Swarm showcases Blizzard at its best. A compelling campaign with great cutscenes and story and competitive multiplayer with incredible balance. The Zerg cast show infinitely more personality than their Terran counterparts which seemed to rely on clichéd stereotypes. Hopefully we won’t be stuck waiting another three years for the third part of StarCraft II, Legacy of the Void, which will follow Zeratul and the Protoss.